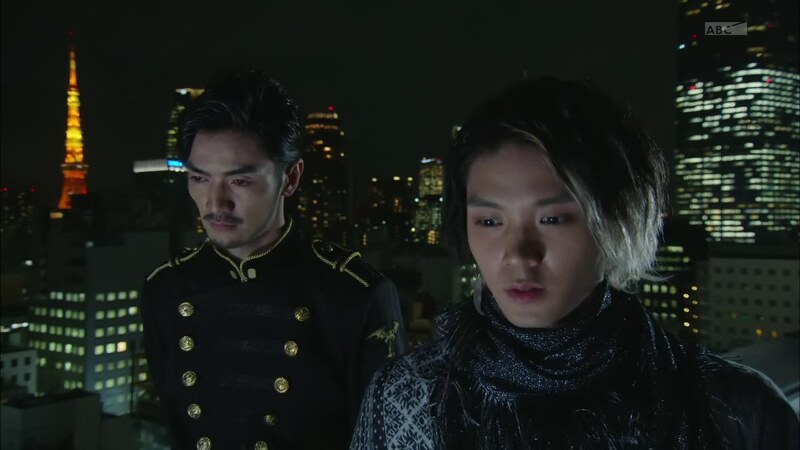 Recap: Kamen Rider Ghost, Episode 9 – Imposing! A Man of Loyalty! Makoto tells Kanon that he’ll for sure take all of Takeru’s Eyecons. But Kanon says he doesn’t have to. She tells him he’s changed and it’s because of her. But Makoto says he hasn’t and she needn’t worry. 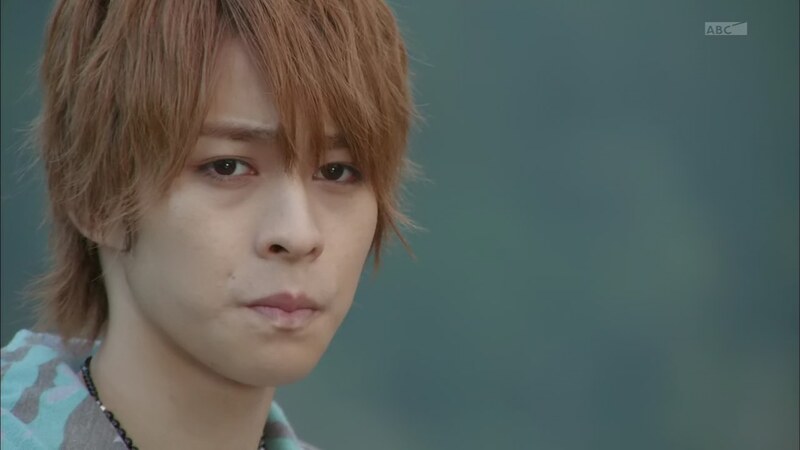 Later, Takeru again has a dream about his father, trying to ask him for answers. The next day, AranAlan has an unexpected visitor from the Ganma World; Javert/Javel/Jaberu/Jabel/Javelle/ジャベル. Javert says His Majesty is unhappy with the progress of the plan and has sent him to see that it speeds up. Aran says to tell his father that everything’s fine. But Jaber says he’s been ordered to help Aran-sama. Aran leaves, saying he has to get “him” to start getting serious too. Over at the temple, Takeru finds Grandpa Sennin is back. With dreads. And a tan. And a present for Takeru, a Shiikui Shindaka. But Takeru wants some answers instead. He asks about Makoto-niichan and how him being a Kamen Rider is connected to his father and what happened 10 years ago. Takeru knows all about the story of Musashibo Benkei. What he wants to know more about is his father. He says Sennin is just dodging the question again. No I’m not, Sennin says and poofs away. Takeru wonders what the little idol is. Which actually talks. 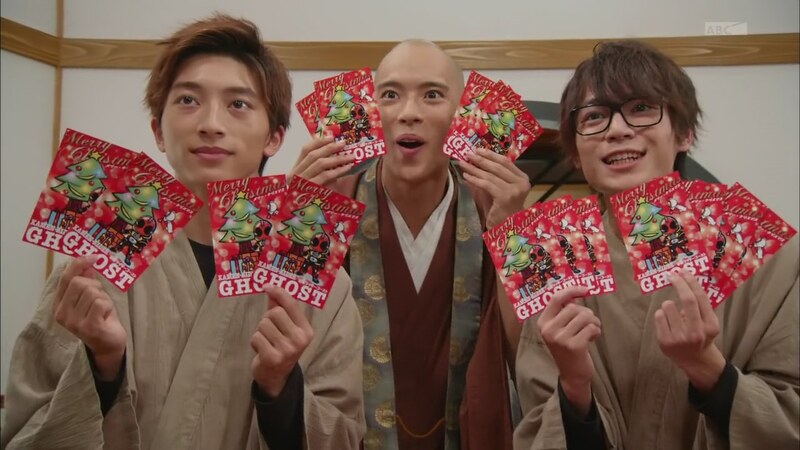 He heads upstairs where Onari excitedly shows him the Christmas cards everyone will get for going to watch the movie this week. 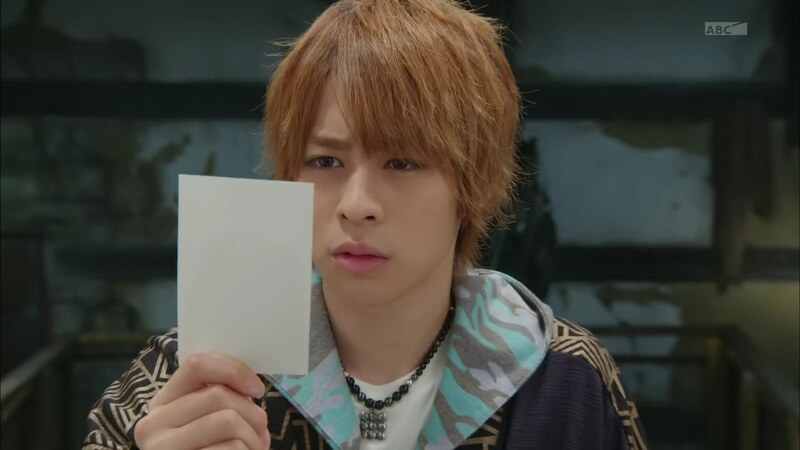 Anyway, the mailman comes with a letter for Takeru. Inside is information on Dr. Igarashi, an influential physics researcher who disappeared ten years ago. It appears there has been some paranormal activity at his old lab. Takeru looks at the photo of Igarashi and seems to recognize him. Indeed, the man is in pictures with his father. 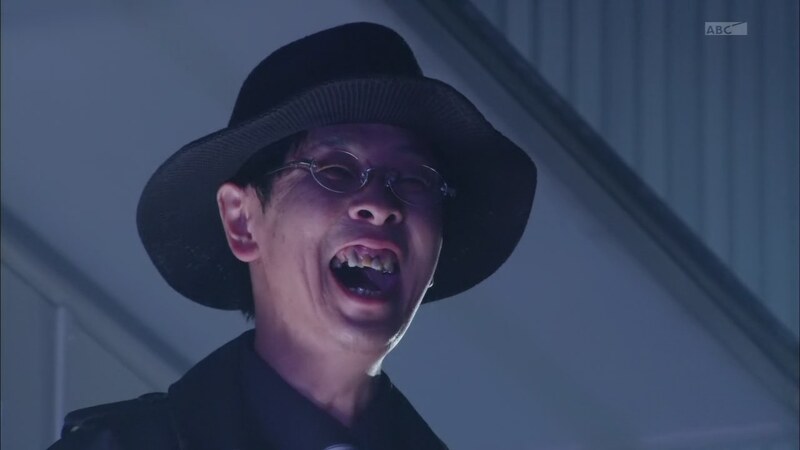 But Akari and Onari also recognize Saionji as the man who brought forth the Billy the Kid Eyecon. Akari wonders if this is all a trap. But Takeru is willing to take a chance if it means they get answers about The Incident ten years ago. Meanwhile, Saionji is on a rooftop looking at his own copy of the photo and saying while Tenkuuji Ryuu was a brilliant leader, he hated him so. Saionji flashes back to Ryuu-san talking about wanting to connect to “this world” for the next generation which includes Takeru and Makoto. Ryuu tells Saionji and Igarashi that they are the only ones who can do that and asks if they will believe in him and help. Saionji tells a Ganma to make sure Takeru follows the trail well. The trio head to the laboratory and ask about the strange happenings lately. The researcher explains the situation and brings them to the room where all the flying things happened. He points to Igarashi’s desk. Takeru asks more info about Igarashi. The researcher says Igarashi was introverted and a little eccentric. Right before he disappeared, he was immersed in some very disconcerting research. But there was always one person he’d pick up the phone for: Tenkuuji Ryuu. They leave the lab. 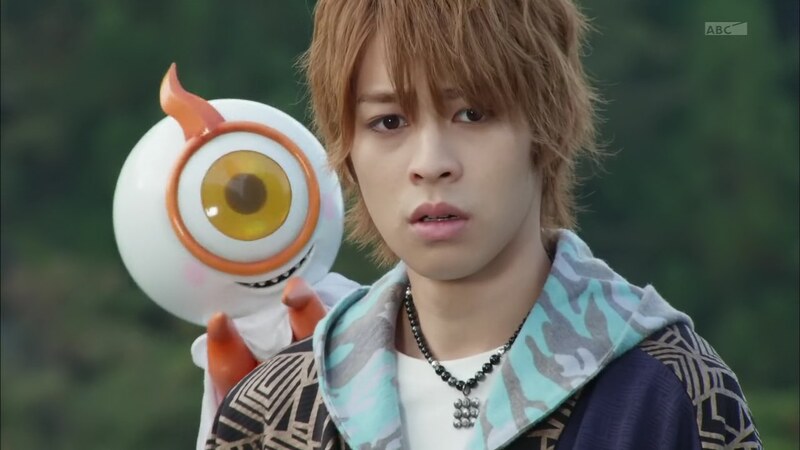 Akari notices Takeru deep in thought. He thinks Makoto and Igarashi’s disappearances ten years ago was all because of his father. But Akari tries to comfort him and says they’ll get answers when they meet Igarashi. The trio head to the location Igarashi last used to conduct his research. Onari finds a notebook full of formulas and Akari says she’ll have to analyze it before knowing what any of it means. 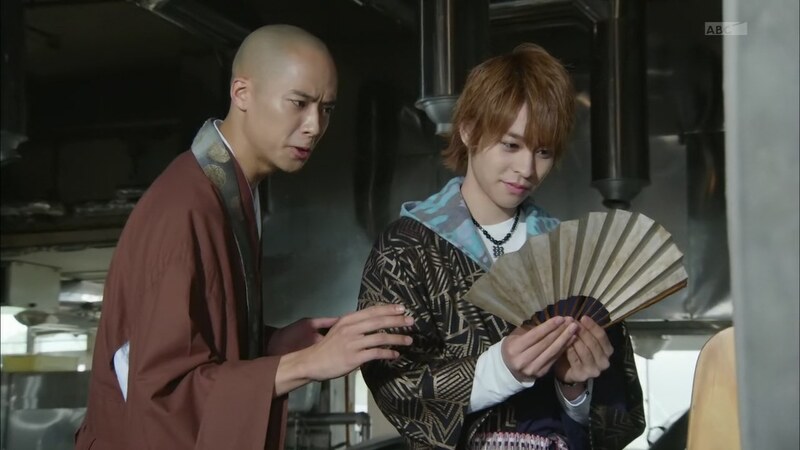 Takeru then finds a fan with written tanka poetry on it. He believes this must have belonged to Benkei. The tanka was written by Minamoto no Yoshitsune whom Benkei risked his life to save. Yoshitsune composed this poem when he thought they would be separated to say that they would meet again in the next world. With this here, Benkei’s Eyecon must be somewhere close. Takeru turns around and finds Igarashi has been there, watching them. Igarashi runs and Takeru pursues. Igarashi stops when Takeru says he is Ryuu’s son. Takeru asks about The Incident. But Igarashi says he doesn’t want to be involved anymore. His future is already lost after having believed in someone once before. The Ganma appears and attacks Takeru. That allows Igarashi to run off. Takeru henshins and they fight in the forest. When the Ganma’s power appears too strong, Yurusen pops in and tells Takeru to use his head. Aha! Takeru uphenshins to Robin Hood and unleashes an Omega Strike which forces the Ganma to leave. 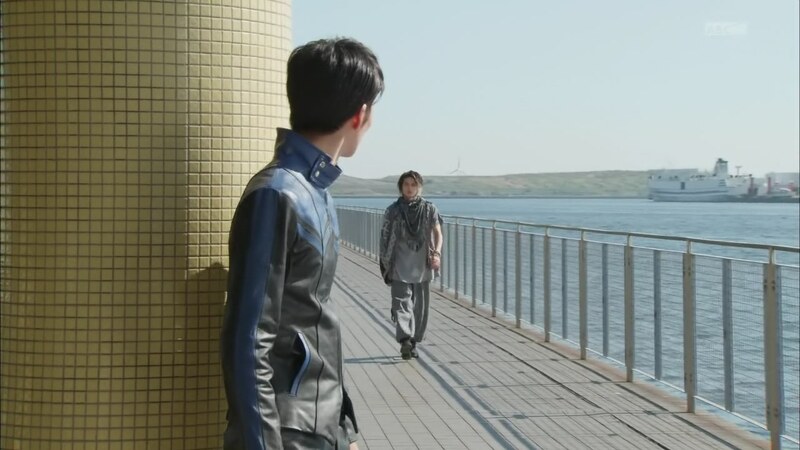 Over by the water, Aran approaches Makoto and asks for his help in accelerating his plans. Makoto says he has no time for any of that. Javel will not stand for this disrespect of Alan-sama and decides to teach Makoto some manners. Jaberu knocks Makoto around, but Aran stops him. “You’ve changed,” Aran says to Makoto. He walks away and tells Javelle to come with. Back at the temple, Akari sees a message written on the last page of Igarashi’s notebook. It appears to be Igarashi asking Ryuu-san for forgiveness for not dying in his place, not bringing the traitor to justice and not being capable of following in his footsteps. Takeru runs out to try and talk to Igarashi once more. They all head back to Igarashi’s lab where he sits in silence. Takeru sets Benkei’s fan down and tells Igarashi that he needs to help his Makoto-niichan, his friend. Igarashi says Ryuu-san was the only one he could call his friend. But then he died and all hope died with him. Takeru says he may not know what happened in the past or what will happen in the future, but he vowed to live his life burning brightly until the end. He believes in himself! Igarashi flashes back to Ryuu saying the same things. That they should not give up. They should believe in humanity’s potential. Igarashi tells Takeru that he is very much like his father. If he once thought everything died with Ryuu, now he sees that maybe there’s something to believe in yet. 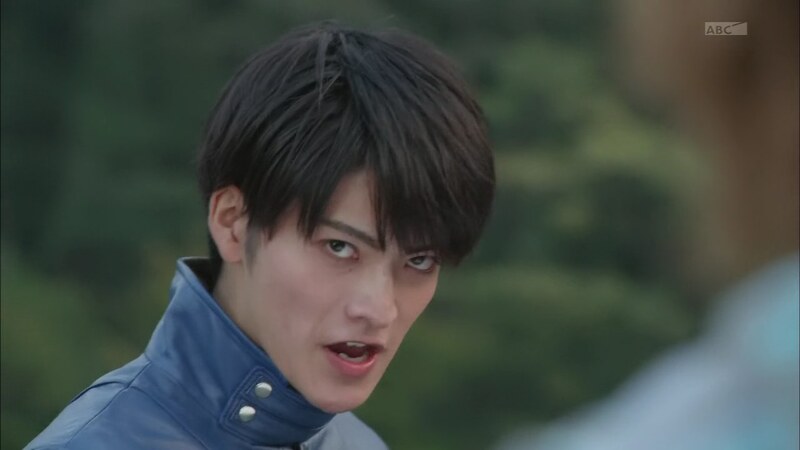 Igarashi is ready to tell Takeru everything. But the Ganma suddenly appears and attacks Takeru. Onari has Spider-dono make the Ganma visible. 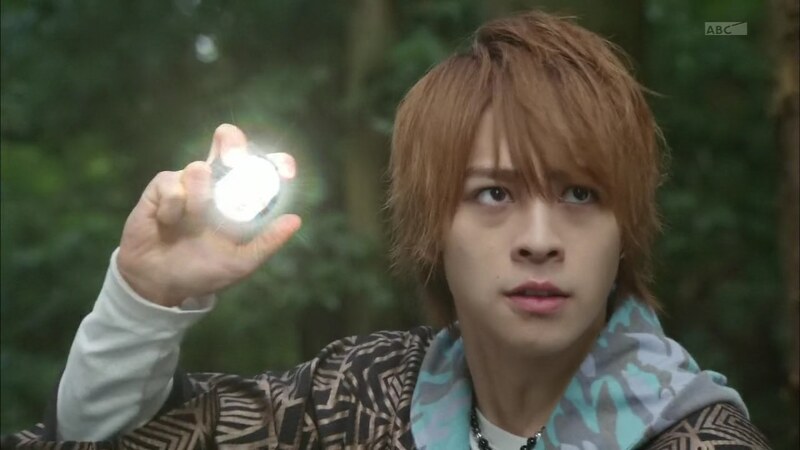 Takeru tries to henshin, but the Ganma whips the Eyecon out of his hand. The Ganma goes to slash at Takeru, but Igarashi takes the hit instead. Igarashi starts to glow and tells Takeru that to follow in his father’s footsteps, he should follow the path he believes in. The Benkei fan starts to glow as well and the Ganma orders Takeru to bring forth the Benkei Eyecon. So that was the plan all along. Takeru is pissed. 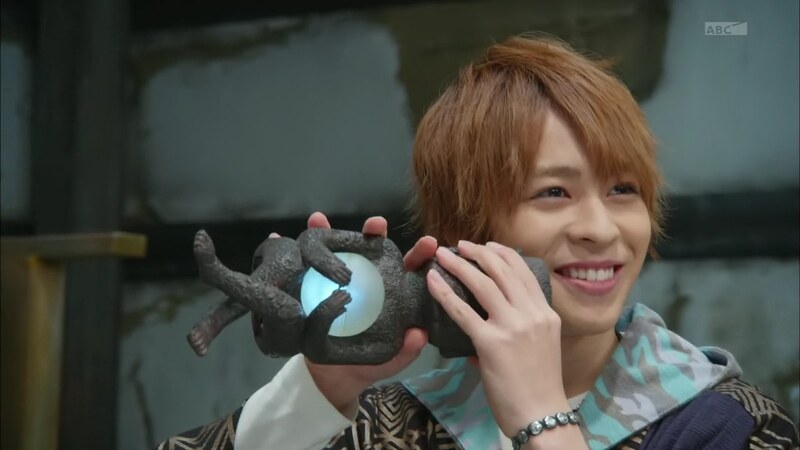 Onari picks up the Eyecon and tosses it to Takeru who henshins. 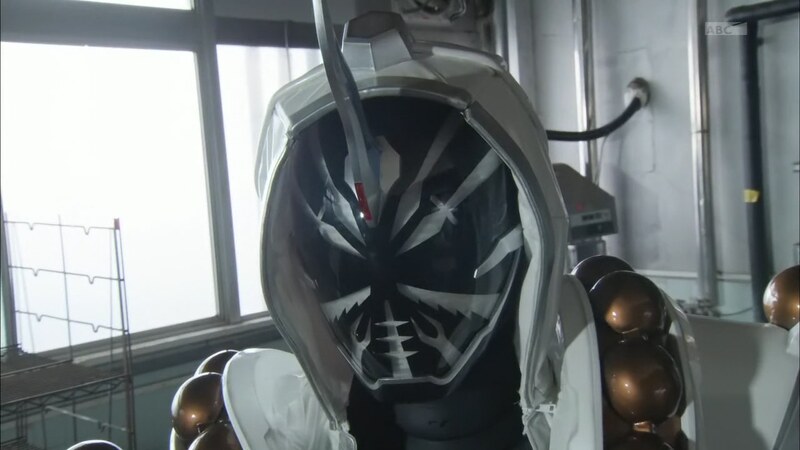 He draws the eye over the fan and out comes Benkei who flies into Takeru’s belt and pops back out as an Eyecon. 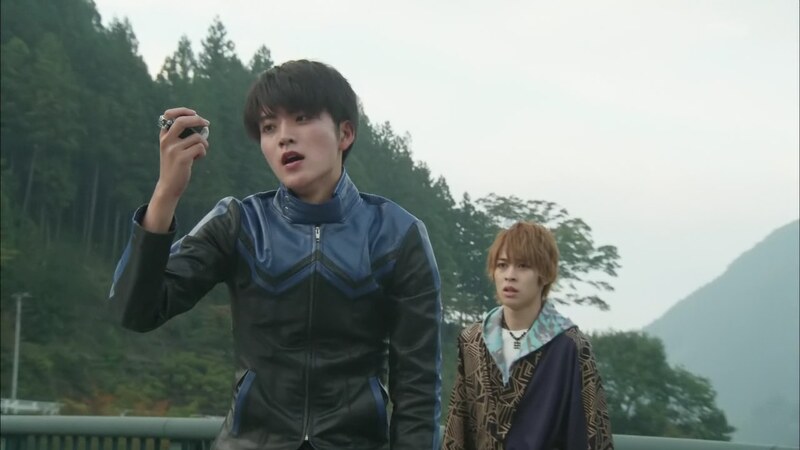 Takeru tells Onari to get Igarashi to safety while he does some quick hand tricks to keep the Ganma from taking the Eyecon. Yurusen knocks Takeru in the head and tells him to uphenshin to Benkei already. Spider hops out of Akari’s hands and combines with the Gan Gun Saber to become Hammer Mode. Takeru and the Ganma take their fight to Gojou Bridge where Benkei and Minamoto no Yoshitsune first met and fought. Akari follows and gets to the bridge just as Makoto also arrives. 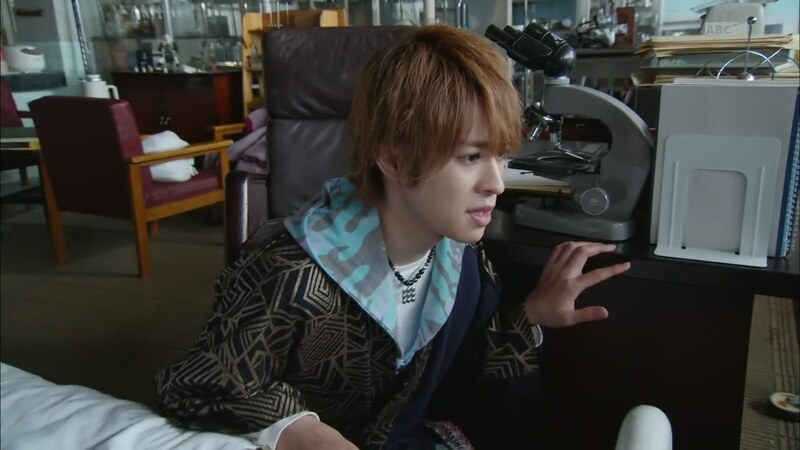 He demands Takeru hand over all his Eyecons. Makoto-niichan henshins and charges toward Takeru. The Ganma says he’ll leave this fight to Makoto and walks away. Makoto goes King Tut. Takeru says he can see Makoto-niichan’s pain and has decided that he will help him. Makoto unleashes an Omega Fang, but Takeru unleashes an Omega Bomber which absolutely overpowers it. The attack forces Makoto-niichan to dehenshin. Kanon gets thrown to the ground and she calls to her brother. Both Akari and Takeru hear the voice. Takeru dehensins as Makoto reaches for his sister. Kanon asks if he’s okay. Yurusen pops in and says this is very interesting since there’s a girl’s soul in that Eyecon. Takeru realizes that must be Kanon. 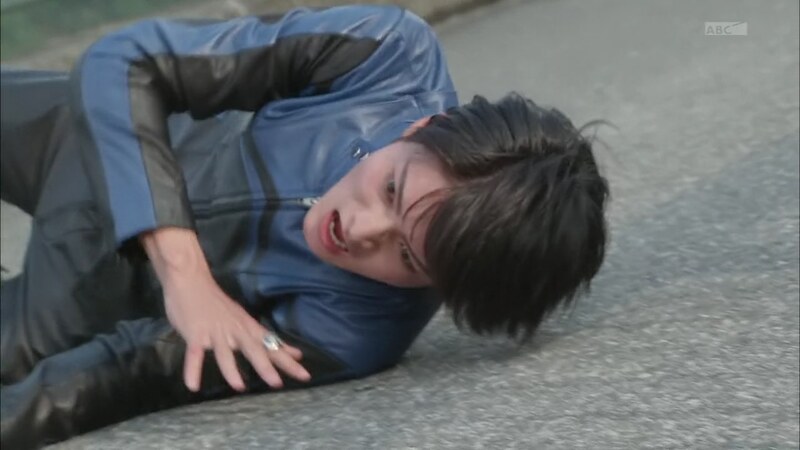 He walks over to pick her up, but Makoto leaps at the Eyecon. Later that night, Aran and Jabel watch over a big eye over the train station before they move on to the next one. 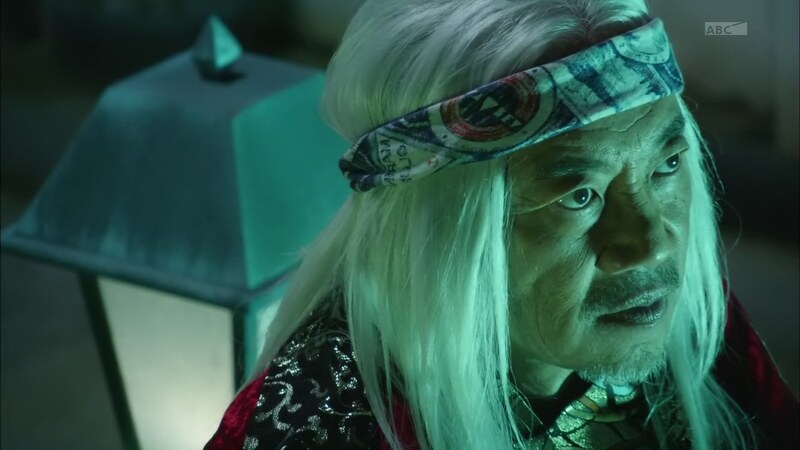 Meanwhile, the Ganma is with Saionji who says now that the final Eyecon has been born, everything is going according to his plans. He cackles. Grampa Sennin is standing in front of the monolith, staring intently at it. A little better with the exposition this week I think. We learned a little more about Ryuu-san’s sketchy plans. But Igarashi seemed more like a one-off character than someone who was directly involved with “The Incident” and whatever strange things Ryuu-san was working on. He obviously didn’t die, so he should be able to reveal everything to Takeru once he’s recovered from getting his back sliced open. lol But we’ll see. We don’t yet know what the endgames are for either AranAlan, Saionji or Gramps Sennin. And His Majesty, Papa AranAlan could very well have some other goal too. 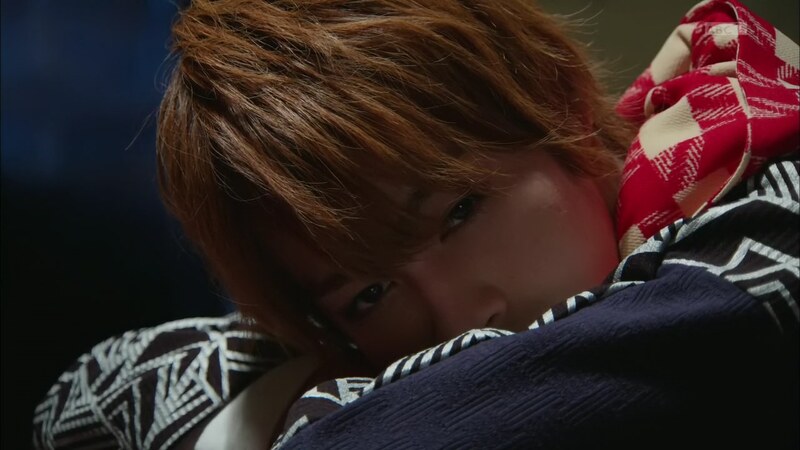 But for now, it’s interesting to see what could’ve been Gou’s story in Drive last season. Whatever Ryuu-san was working on obviously triggered some unwanted consequences, including sucking Makoto and Kanon into the Ganma World of Hell. And now Takeru basically needs to clean up his father’s mess and atone for whatever possible sins Ryuu-san may have committed. That exactly should have been one of the major threads on Drive with Gou and Banno and definitely Kiriko. They even teased Papa Tomari having some kind of hand in the whole mess too before dropping it like a hot potato with a simple explanation. So hopefully here, if they go this route, they’ll have plenty more time to flesh it out in a complete way. Elsewhere, the story of Benkei and Yoshitsune sounds very fascinating. I see again the parallels they’re trying to make with our gang here and it’s very creative. 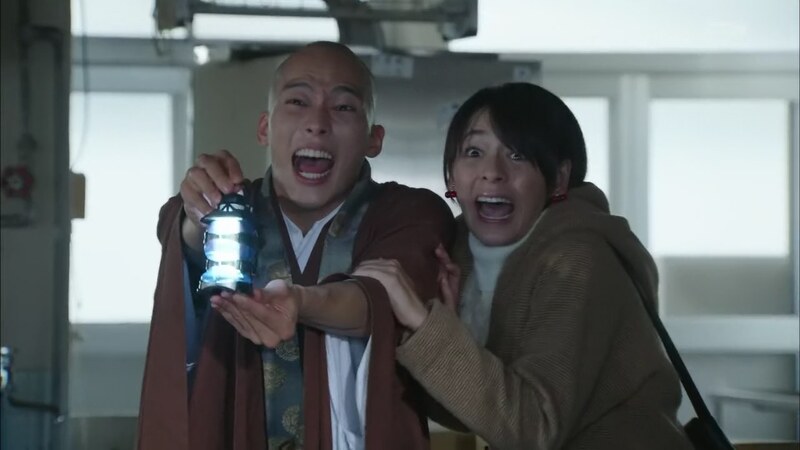 Also, the scene of Onari calming an overexcited (and overacting) Akari and telling her to be quiet was very amusing. Though both have definitely toned it down since their loud introductions. Overall, another good episode. It appears things are definitely starting to move along. 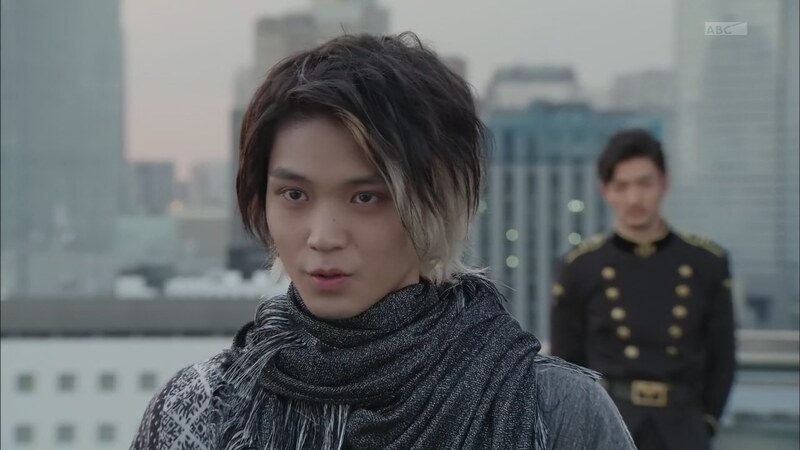 ← Recap & Check-in Review: Power Rangers Dino Charge, Episode 20 – "It's all part of the adventure." Wow! They’re transitioning to the arc-based narrative much earlier than I expected. Though I am pleased that they didn’t prolong the whole “eyecon collection” arc since they already said the last one has been created already. 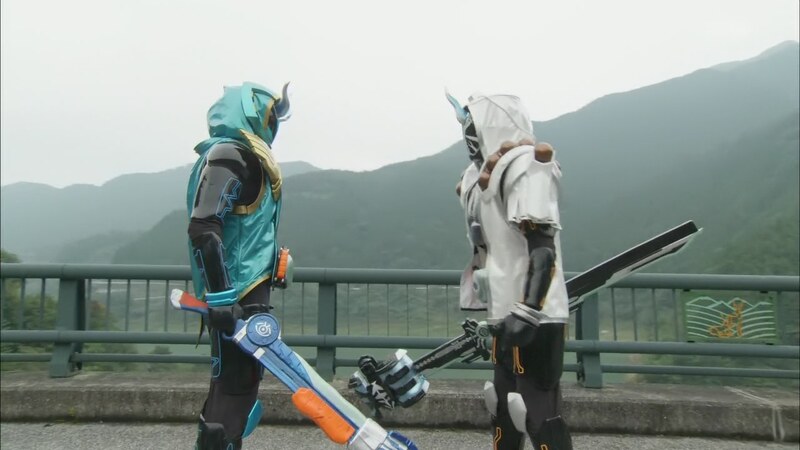 Looks like this one is a mix of Drive, Gaim, and Wizard in terms of what the various factions are trying to achieve. Yeah, I hope this one doesn’t suffer Drive’s fatal flaw.